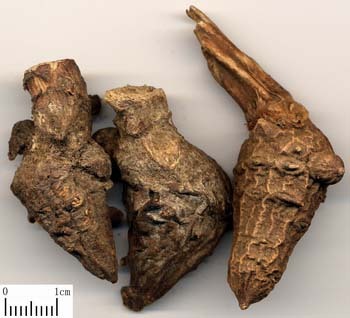 The tuberous root of Aconitum carmichaeli Debx. of family Ranunculaceae. Sichuan, Yunnan, Shaanxi and Hunan provinces, etc. Dug out from the last ten days of June to the first ten days of August. The raw Chuan Wu is light in smell, pungent, spicy and benumbing in taste; while the prepared one is slightly benumbing without stink. Big, fat and solid nature without residual and fibrous root. Dried in sunlight, unprocessed or prepared for use. 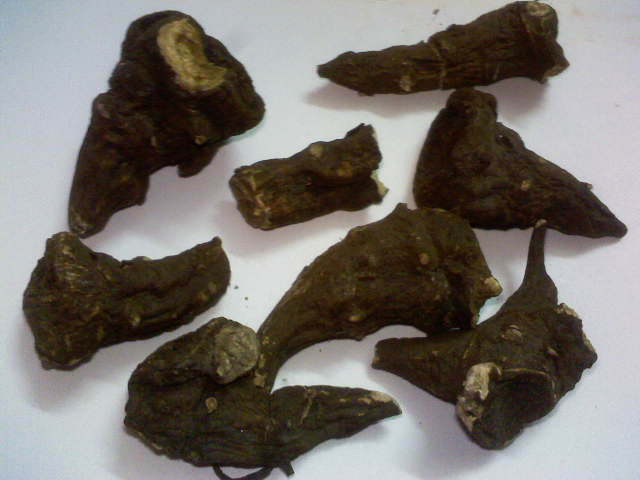 Pungent, bitter, hot; strongly toxic; heart, liver, kidney and spleen meridians entered. Being pungent, hot, dry and violent in property, it excels in dispelling wind-damp, warming meridians to dispel cold, and alleviating pain markedly; it is rated as the better herb for treating arthralgia syndrome due to wind, cold and dampness, especially for arthralgia aggravated by cold predominantly; it is often combined with cold-dispelling and collaterals-unblocking, nutrient-harmonizing and pain-alleviating herbs, for example, Ma Huang, Shao Yao and Gan Cao, as in Wu Tou Tang from Jin Kui Yao Lue. For cold-dampness and stagnation of blood stasis in meridians manifested as spasm and pain of limbs and tendons, difficulty of flexing and extending of the joints and persistent unhealing, it should be combined with blood-activating, collaterals-unblocking and pain-alleviating herbs, such as Ru Xiang, Di Long, as in Huo Luo Dan from Tai Ping Hui Min He Ji Ju Fang. Being pungent and warm with the actions of dispersing and smoothing, it has a marked action of dispersing cold to alleviate pain, and commonly indicated for pain due to cold congealing and obstruction of meridians. For cold pain of epigastrium and abdomen caused by excess of internal yin-cold, it is often combined with other cold-dispelling and pain-alleviating herbs, for example, Gan Jiang and Chuan Jiao. It is also indicated for hernia and bellyache due to cold. It can also be used to treat traumatic injury and pain with blood stasis after fracture, and often combined with blood-activating and trauma-healing, collaterals-unblocking and pain-alleviating herbs, for example, Zi Ran Tong, Di Long and Wu Yao. The unprocessed one can be used in topical application with Cao Wu, raw Tian Nan Xing and Chan Su for anesthetizing to stop pain. Decoct 1.5~3 g. It should he decocted firstly until no benumbing taste left; and then other herbs are put in. Proper dosage is for topical administration. 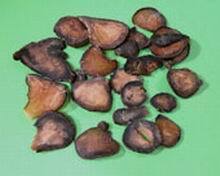 It is contraindicated to pregnancy, and antagonistic to Ban Xia, Gua Lou, Bei Mu, Bai Lian and Bai Ji. It should be processed for oral administration; and cautions should be paid when the crude products are taken orally or it is used in wine soak and decocted in wine which will easily lead to toxication.